Our Lund home, on 3 acres of waterfront property, is just 2 km across the water from SAVARY ISLAND; 2 km south of the Copeland Islands; 8 km from DESOLATION SOUND; a short walk from the Lund Harbour Marina and Nancy's Bakery; and only a 30 minute drive from the amenities of the town of Powell River. Note: The VRBO website currency default is $US. The rates are for the use of both floors, though if you have a smaller group (5 or less) and don't wish to rent the full home, we also have pricing for the rental of only the upper floor (please enquire, since this website's format doesn't have a way for us to post those rates). Access Savary Island's SANDY BEACHES easily, while enjoying conveniences and features not found on the island. You can make day trips to Savary Island using the nearby Lund Water Taxi... or we have made arrangements with Terracentric Coastal Adventures, so that you can hire them to take your family by water directly from our bay to a Savary Island beach for a worry-free day trip... no lugging your beach gear up and over Savary by foot ,while trying to keep your kids happy along the way ;) Terracentric is also available to take you on zodiac boat tours of amazing and remote parts of Desolation Sound. Come experience a piece of coastal heaven in a magical cottage at the water’s edge! We are a family who love the outdoors and the peace the ocean brings. We vacationed in the area for years and always dreamed to build once in our lives. We found this unique property back in 2005 that brought us calmness when we stood at its shore. Its proximity to Savary Island, Desolation Sound, and the amenities of the town of Lund finalized our decision to purchase it. Now our dream home is ready to share! This home is amazingly beautiful. It's relatively secluded on it's own little bay! The home is beautiful and well equipped with all that you might need. Access to the water is easy for adults (kids just need a hand to hold onto), and exploring the beach is wonderful. We had a group of 7 (3 couples and a single). The single had to share a room with one of the couples; otherwise there are many beds to choose from! The downstairs twin bed area would be a lot of fun for several kids! The master suite is fabulous with a soaker tub looking out to the water. The design of the house was great for active people, such as ourselves. The deck leading to the stairs/water was a great place to store kayak gear! They have thought of great details like an outdoor shower on that deck with LOTS of hooks to hang wet gear! BRILLIANT! And you enter into a mudroom with washer/dryer...which comes in handy!!! While the top deck remained our lounge and entertaining area. The hammocks were lovely and so were the deck chairs! Both of which were used after long days of hiking or paddling. The kitchen is well stocked with all we needed to cook for 7 people. Make sure you bring enough paper products to cover what you use though (toilet paper, paper towels, etc.). We spent a good portion of the evenings on the main deck watching the beautiful sunsets...it's a gorgeous view and setting. The beds are comfortable, the showers are great (bring toiletry supplies) - we never ran out of hot water with 7 of us, and there is ample room for individuals to find secluded spots in and around the house to "get away." Having use of their 3 kayaks was great! We brought up 2 of ours and had a flotilla! Getting our kayaks down to the water was a bit of a challenge, but very manageable. They also had an area with a hose to wash off gear. The house is walking distance to Lund, and close enough to Powell River that it was an easy run for groceries/wine. Some of us took the ferry over to Savary Island and met the others who kayaked over...it was an enjoyable day. Paul was extremely helpful and answered many of our questions ahead of time - and he was very prompt. He chatted with us on possible trips to take and sent us many useful websites. Thanks so much for sharing your wonderful home! When our party of 6 adults walked through the front door of our Lund house for the first time, we were awestruck! It was as if the house was built in the treetops perched on the ocean shore! And it was even more amazing as we took in the workmanship of the home. The Shores beautiful home is everything a person could ask for in a vacation getaway! Whether enjoying sunsets from the spacious deck or at the picnic table tucked in the woods, kayaking in the afternoon sunshine from our own beach and discovering basking seals and sea lions on the cliff's rocky edge, cooking meals in the gracious and well-appointed kitchen, taking morning walks into Lund for lattes and yummy pastries at Nancy's Bakery, excursions to Savary Island or into Desolation Sound, or just hanging out with good company at the Shore's lovely home, our vacation was a truly delightful and memorable experience. The Shores were helpful and responsive. When we were short one adult life jacket, they immediately provided a contact for getting one. We would stay at Shores by Lund in a heartbeat and would highly recommend this property. Thank you, Shore family, for sharing your home with us. We had a fabulous trip! House was very comfortable and nice. Views were spectacular. Ocean breeze and sounds were amazing. LOVED the outdoor shower, and used everyday. Paul (owner) is very pleasant, helpful and responsive. Private beach/bay is wonderful with oysters, mussels, starfish, crabs, jelly fish, and more. Kayaking was epic. Savory Island was MAGICAL! Christine at Terracentric in Lund was very helpful with arranging guided tours. Nancy's Bakery, Boardwalk Restaurant and Laughing Oyster Restaurant were all good, but not great. With a hot tub, this place would be perfect. Nevertheless, we would HIGHLY recommend a stay here. If you're looking for a serene private getaway, this beautiful modern oceanfront home is the jewel you've been looking for. Strategically set amongst the forest, incorporating ocean views from every room in the house, its three massive decks set a wonderful stage for reading, bird, seal, and bear watching, dinners, and yoga stretching. The kayaks provided make for a wonderful easy paddle across to Savary island which holds its own magic to explore. We hope to return with our friends and kids to explore more of this tranquil place. The home is perfect for family getaways and reunions. The Shores were fantastic with quick email responses to any questions we had. They have created a home that is the perfect model of feng shui of modern living. This was the perfect place to bring our friends from the UK with their 3 young children. There was plenty of space for all 4 kids and 4 adults. The views from the decks were amazing. The hammocks on the lower deck were very popular. We spent plenty of time on the water using the kayaks. Christine at Terracentric in Lund was very helpful with arranging a guided paddle and a zodiac trip into Desolation Sound. The owners were very helpful and we would highly recommend a stay here. Shores at Lund was a perfect family getaway for my family, my brother's family and my parents. There was a ton of space so we could all hang out together easily, or retreat to our own spaces for some family downtime. Highlights were spending time on the huge outdoor decks (playing charades into the sunset! ), the outdoor shower, use of the kayaks (as I also brought my paddleboard), quick walk to Nancy's Bakery, and proximity to Savary Island. I had never been to that area of the Sunshine Coast and this was an incredible introduction! Our magical Lund cottage on the northern end of the Sunshine Coast is just 2 km across the water from Savary Island, 2 km south of the Copeland Islands, 8 km from Desolation Sound, and only a short walk from the Lund Harbour marina and from Nancy’s Bakery and her famous cinnamon buns! 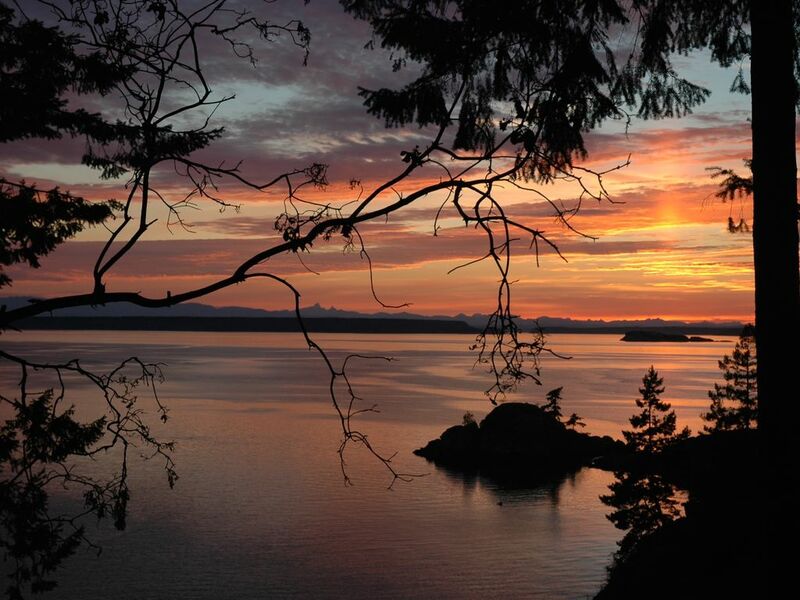 Come experience a piece of British Columbia coastal heaven!